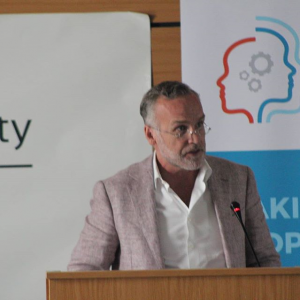 The event ‘A healthier wealthier Africa: behavioral science, digital innovation and beyond’ took place this morning from 9 AM to 12 PM in Nairobi at Strathmore University’s Microsoft Auditorium. The Centre for Advanced Hindsight, Duke University, Joep Lange Institute and the Amsterdam health & technology institute (ahti) welcomed participants to the workshop. Laurens van Hoorn, ahti’s Managing Director ahti discussed innovative health apps in the Netherlands. These days, mobile applications are playing an important role in healthcare. At home, in hospitals or wherever people are, mobile healthcare applications provide a complete new dimension in the treatment and support of patients. Ahti contributes to this with ahti’s accelerator program HealthInc. We help entrepreneurs to develop their product by giving them access to our network. Together, we support the development of technology that will empower the patient or healthcare professional to better track, manage and improve health and healthcare delivery. Last year, three of these startups developed products based on behavioral science ahti: Asthma Compass, EGG and 3EGA. Ahti brings people together to work on innovation and entrepreneurship in health. We help payers, providers and entrepreneurs develop solutions for better quality of care, higher patient satisfaction and more cost-efficiency in Amsterdam and the rest of the world. The Centre for Advanced Hindsight wants to make people happier, healthier and wealthier with behavioral science, at home and abroad. Duke’s vision for the next decade is “to grow, connect, and empower diverse and inclusive communities of excellence to enhance the creation, delivery, and translation of knowledge for a rapidly changing world. The Joep Lange Institute combines science, activism, and pragmatism to make health markets work for the poor in countries where the system fails the people.